Following Socrates and Spinosa, today it is philosophers like Michel Serres or Edgar Morin who allow us to ask questions about our profession and to clarify our own thinking. In Geneva, the history of the practice of philosophy began with a teacher at the Ecole Active de Malagnou, Paule Watteau. She had managed to get hold of equipment from Matthew Lipman (then unknown in Geneva) and she led philosophy workshops with her 9-year-old students. At the time, she was the only one to do this. 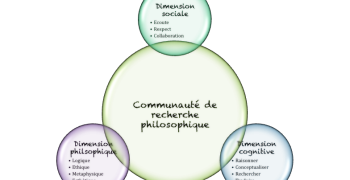 Then, following a lecture given by Michel Sasseville in 1998 in Lausanne, a group of people gathered to create an association whose mandate was to promote the practice of philosophical dialogue. The ProPhilo association was born and Paule Watteau was President for several years.